After a long and strenuous afternoon of volleyball, the Lincoln Boys' Volleyball team brought home the gold in the local NISSA tournament. The games were off to an early start as the Snow Leopards faced The British School in an early 9 AM match. Although it was the first game this season, the boys came together well as they defeated TBS comfortably 2 sets to 0. The day continued with the Snow Leopards facing the Little Angels School in their second game. Definitely the most fervent, the Snow Leopards lost the first set but made a 24-19 comeback, to win the second. In an unfortunate turn of events, victory over L.A. remained just out of grasp - but only by the skin of their teeth. Though recording a loss, the boys felt the results was quite positive; a game against such eminent opponents only helped gel the team further. The challenge unified the team, exposing strengths and weaknesses to be addressed in future practices. Going into the next game ready to redeem themselves, the Snow Leopards defeated the Valley Public Higher Secondary School. Taking into consideration everything they learned from the previous game, the boys pushed hard and won the third set to proceed to the finals. Exhausted in body but not spirit, Lincoln, once again, encountered VPS in the finals of the NISSA tournament. With every bump, set, and spike executed with expertise and determination, the Lincoln Snow Leopards triumphed in the third set to take the win. 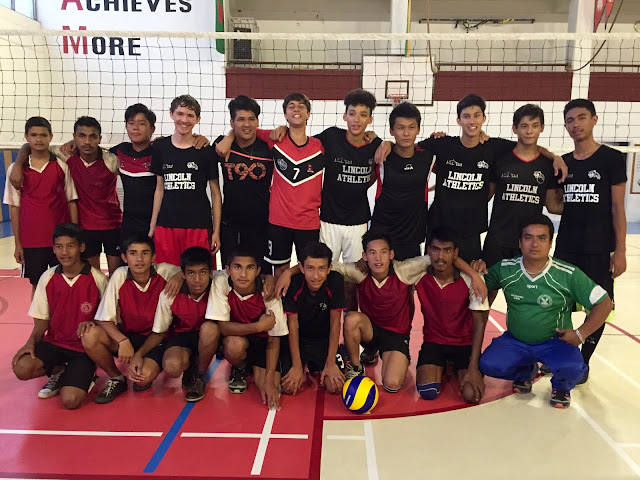 The Lincoln School Snow Leopards took first place after an afternoon of exciting volleyball. Not bad for the first competition of the year. Looks like there’s a lot to look forward to this volleyball season!